Which Piece of Compact Equipment Is Right for Your Operations? Skid steer and compact track loaders don’t look like compact wheel loaders — or move like them. One type of machine skids its tires to change direction or rumbles around on tracks, whereas wheel loaders have traditional steerable wheels and usually articulated steering. But each of the machines often has a bucket up front, giving it the traditional moniker of “loader.” So how is a person in the market for a small loader supposed to choose among them? Size matters, as well as available space in which to operate the machines. Skid steers generally are shorter and have the unique ability to turn around in their own length. In confined areas where backing room is minimal, a pirouetting skid steer may be the only choice. In slightly roomier areas, a four-wheel-steerable compact wheel loader might more efficiently perform a repetitive scoop-and-load function. Defining “compact” might be helpful for shoppers. Skid steer loaders started out small and many models still are, but the units seem to be growing bigger and heavier. Wheel loaders, conversely, seem to be growing smaller to increase their versatility. Just what constitutes a “compact” wheel loader is not standardized. “There is no definitive line,” Coffey says. “A good rule of thumb is that if the bucket capacity is less than 2 yds, it is a compact wheel loader.” Other manufacturing reps say the delineation point for a compact wheel loader is when the bucket holds 1 yd or less. Still others say any wheel loader under 100 hp is compact. Finally, it is argued that 100 hp or less plus a bucket holding less than 2.35 yds of wmaterial divides compact and regular wheel loaders. Shoppers might be better off just forgetting the “compact” tag and see what works best for them. Cost can definitely be a factor in selecting one machine over another. Generally speaking, a compact wheel loader will have a higher showroom price tag than a skid steer of comparable capacity. The difference isn’t huge, but can be significant enough to induce a mild version of sticker shock. On the other hand, operating costs often are less in a compact wheel loader. Its more flexible range of operating speeds compared to a skid steer can produce fuel savings that over the lifetime of a machine will more than offset the higher initial cost. Also, a skid steer skids on its tires and that can mean more tire-buying than is the case of a wheel loader. Ultimately, features and brand loyalty will sway buyers to prefer one model over another. Without taking anything away from staying with a familiar brand, the fact is that features do differ among the machines; how those differences affect performance and profitability should be a top consideration for a shopper. High visibility might seem like a given, for example, but until a buyer actually crawls in a cab — or, if he is comparison shopping, in several cabs — he can’t fully see the difference. The heritage of Terex wheel loaders goes back to 1971, with Terex taking over the line in 2002. 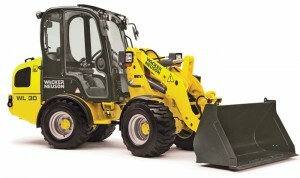 However, its skid steer loaders date only from 2011. When Terex engineers worked up the relatively new line of skid steers, they consciously sought to match or exceed the performance of older lines. 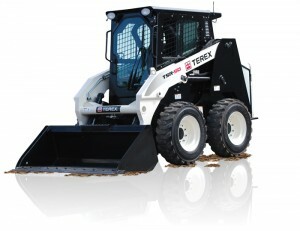 Consequently, Terex skid steers have 10 in. of ground clearance — which is more than many — for working in rough terrain and slightly faster speeds when traveling from one job to another. “We polled a variety of customers that use competitive models and found that many of these attributes are extremely important during the buying process because they contribute to higher productivity and lower cost of ownership,” says Terex product manager Jamie Wright. Some skid steer loaders and compact wheel loaders have fully interchangeable attachment coupling systems — some don’t. This interchangeability can increase fleet utilization. Furthermore, the hydraulic flow rate of skid steers and wheel loaders can differ, which also is a consideration in utilization of attachments, says David Morice, compact equipment business unit manager for Yanmar America. “Skid steer loaders tend to have a little higher flow compared to wheel loaders. Though most attachments should run with the standard flow rate, some attachments, like planers, will require the higher flow,” he says. Compact wheel loaders, for example, offer hydraulic flow rates of 15 to 33 gallons per minute (gpm), whereas hydraulic fluid in skid steers flow from 10 to 40 gpm. One variable offered in Yanmar skid steers is five “drive modes,” which range from slower engine and hydraulic reactions for beginning operators on up to more aggressive settings for old hands on the controls. Cat skid steers have what product marketing engineer Kevin Coleman says is the industry’s first integrated rear view camera solution for better backing visibility. “Customers are asking for that kind of functionality. They want to have ultimate control and visibility on a jobsite.” Other Cat skid steer features include operator customization of a machine, with 11 adjustable operating parameters to fit a particular operator — including a choice of six languages. Up to 50 different operators can customize a machine to fit individual preferences. Cat compact wheel loaders offer a “creeper control” that sets complementary rpm and travel speeds to fit a task — for instance, higher engine speed and slower forward speeds for when a machine is snow-blowing. Another set of controls matches a wheel loader’s hydraulics and drivetrain to the relative aggressiveness of a task, distinguishing between, say, loading dump trucks and delicately balancing pallets. 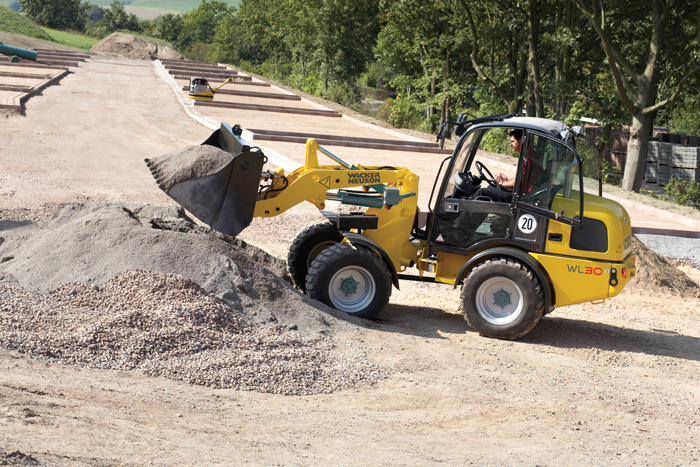 Wacker Neuson claims to offer the widest range of loader options, the highest lift in the skid steer industry (for the size class it competes in) and best service access to component areas. “And with the WL30, we have the only wheel loader you can fit comfortably on a sidewalk for clearing snow. It is only 48 in. wide,” says Coffey. Wacker Neuson, like other manufacturers, tests prototypes with selected end-users to guide development. An Idaho landscaping contractor was instrumental in the next generation of Wacker Neuson skid steer loaders, Coffey says, providing valuable feedback on details as incidental as the radio’s location in a cab. Of course, cabs overall are a big consideration. In a skid steer, you’ll need to climb over an attachment to enter the cab (unless you’re entering JCB’s or Volvo’s one-armed skid steers or track loaders). On a wheel loader, you’ll climb up a few steps. Both cabs can be outfitted opulently or with bare-bones ROPS.